The Lady Trojans made sure that there were no doubts who the top team in the Sunset League was by beating Mojave on Monday in five sets, 21-25, 25-15, 25-8, 15-25 and 15-8. 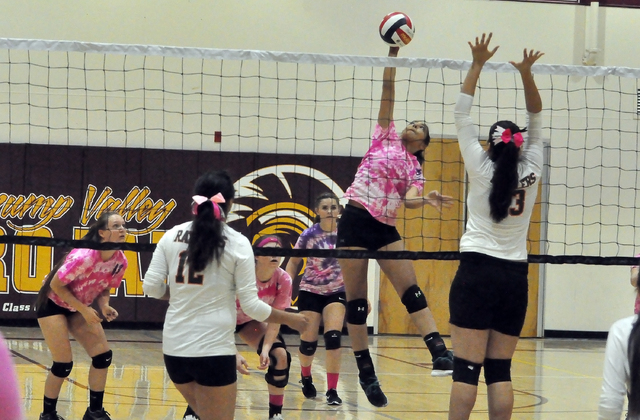 Horace Langford Jr. / Pahrump Valley Times Maddie Hansen serves against the Rattlers. The freshman is the youngest player on the varsity team. Horace Langford Jr. / Pahrump Valley Times Isabell Meza goes for the ball against Mojave. 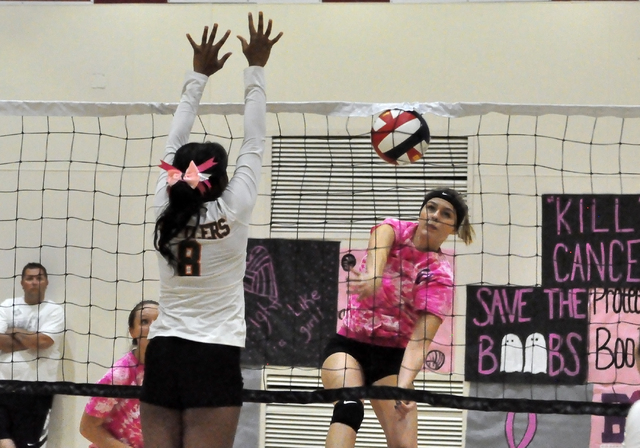 The Trojans won against Mojave in five sets. It was the first time this year that they had to go to five sets for the win. Horace Langford Jr. / Pahrump Valley Times Alexis Trieb gets some net on this ball. She got a little frustrated but in the end she had 23 kills to help the Trojans win. 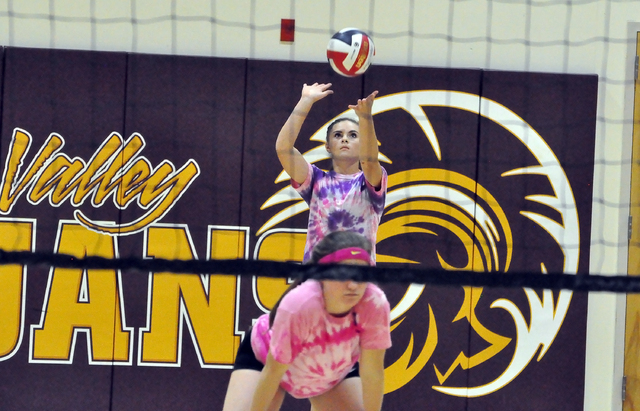 It took longer than usual as this was the first time the Trojans played five sets this season. Harris was referring to the loss of the first set. The slow starts have hurt the Trojans (15-11 overall, 7-0 Sunset League) in tournament play during the year where they only play two sets and sometimes just one set. Harris also commented on her girls playing the five sets. The coach feels that Mojave was the only team to challenge her team during the regular season. Harris said she had to remind her girls to play hard. The coach is referring to the first round of the playoffs. First-place teams have the home team advantage. With three regular season games left, the coach doesn’t want her team to lose any games to give that playoff advantage away. The coach felt that senior outside hitter Alexis Trieb stepped up and kept the Trojans focused on the task of winning. Trieb had 23 kills for the night and Koral Hearn had nine kills. Trieb said frustration kept her swinging. In addition to an improved team, the Trojans had been playing short for the last two matches due to injuries and this has taken a toll. The team only had two players on the bench on Monday against Mojave. They played Pahranagat Valley (15-5, 4-0) in Alamo, a perennial Class 1A state champion and lost in 4 sets, 25-17, 16-25, 20-25, 23-25. They did that without senior Koral Hearn. And they played Mojave without junior Marietta Sobeck. The Trojans played another non-conference game against Beatty on Tuesday, which was past deadline. The Trojans travel to Desert Pines (1-17, 0-7) today at 6 p.m. On Oct. 25 they host their last home game at 6 p.m against Cheyenne (15-15, 5-2) and their last regular season game they travel to Western (2-8, 2-5) on Oct. 27 at 6 p.m. The girls also have the Longhorn Invitational this Friday and Saturday.